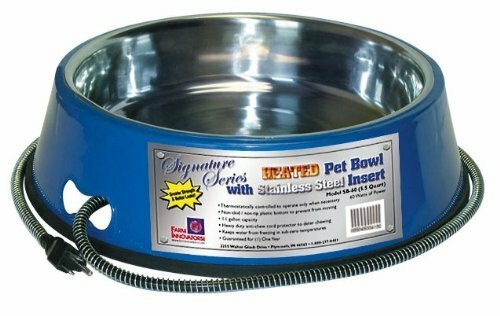 This high quality heated pet bowl features a stainless steel bowl for easier cleaning and better heat retention. The bowl has a rubber base to keep it from moving around as well as a 6' cord with anti-chew metal cord protector. 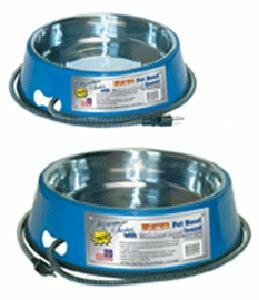 This heated pet bowl is thermostatically controlled to operate only when necessary and prevents water from freezing in sub-zero temperatures. The non-skid/non-tip rubber bottom prevents the bowl from moving. The durable stainless insert is easy to clean. A heavy-duty "anti-chew" cord protector deters chewing. Ideal for year round use. 60 watts. One year limited warranty. The product features a fully grounded supply cord. The grounding process includes a metal stud welded to the underside of the bowl. This may result in a small dimple visible on the stainless bowl. This is not a manufacturing defect and will not impede the ability of the bowl to function properly.